I was driving in an inner city neighborhood in San Antonio, Texas and saw this sign in someone’s front yard. It was so big and so close to the street that it was hard to miss. I can’t believe that this type of ignorance still exists and it really appalled me to see it in San Antonio, a large city with a high percentage of minorities. I hate to give this sign so much attention because that’s obviously what these people are looking for but I think it’s a topic of discussion. It’s so disheartening to know that there are people (a large percentage of them) that cannot see through the surface and judge on a person’s character, their values and their knowledge. i agree with you about this sign why are people being so cruel, its not worth it. Angela, good for you in exposing such a disgusting display of ignorance. I’m continually amazed at the lengths people will go to, to play on people’s fears in the hopes of getting others to think like them. I think most who come across this sign will see it more as a reflection of the individual rather than the masses… at least I hope so. 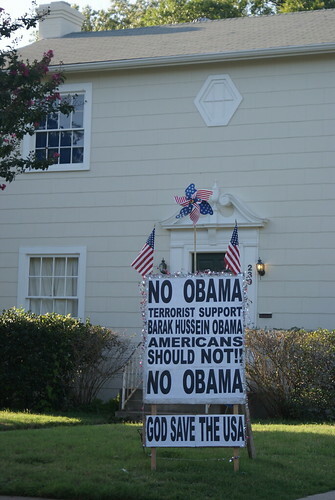 The San Antonio sign reflects common sense patriotism and knowledge that the terrorists still want to kill Americans. Being nice to Islamo-fascists does not make them change their ways. They will take advantage of what they see as weakness. They respect strength and force. Anyone who supports Obama is a die-hard liberal or is woefully uninformed. No it doesn’t, it reflects blatant stupidity. How do you people manage to breathe?